State Representative Kevin Bailey invites area residents to a community meeting to discuss ground water contamination in the area of Eastex Freeway and Hartwick. The meeting will be at the Escamilla Intermediate School located at 5240 E. Mount Houston on Thursday, January 6 at 6:30 P.M.
Chlorinated Solvents have been discovered in a water well on the property of a former manufacturing company that had been located on Hartwick just east of the Eastex Freeway. Water wells located on properties immediately surrounding the area are in the process of being tested. Information on the results of the initial testing will be discussed at the meeting by a representative of the Texas Commission on Environmental Quality(TCEQ). The company Aspen Manufacturing has entered into a Voluntary Cleanup Program with the TCEQ to address environmental concerns associated with the ground water contamination. In order to determine whether or not water wells in the area have been impacted, the company is collecting water samples from area wells and having the samples tested by a laboratory. The water testing is being conducted at no cost to area residents. Bailey went on the say that representatives from the TCEQ, Harris County Engineering Office and the Aldine District will also attend the meeting. Rep. Bailey has a long history of working on water quality issues. In 1991 and 1993 Rep. Bailey passed legislation forcing the city of Houston to provide water and sewer services to 119 neighborhoods annexed by the city that lacked safe water and public sewer. The city completed construction of water/sewer systems in those neighborhoods in 1998. In 1999, he started the legislative session with a series of bills making it more affordable to provide water and sewer services to people living in unincorporated areas of Harris County that do not have adequate drinking water. Also, he was successful in securing a Texas Water Development Board for a Planning Grant, for the Aldine Improvement District, to determine economically feasible alternatives to replace failing septic systems and provide a potable water supply to area residents and business. Rep. Bailey said he was alarmed to learn of the ground water contamination in his district. “We have worked for many years to deal with problems created by homes built on small lots with shallow water wells that may be contaminated from surface runoff from an on-site septic system. Area residents having any questions regarding the upcoming meeting may call Rep. Kevin Bailey’s district office at 281-847-9000. David Suggs was fortunate. He knew at an early age what he wanted to do with his life, and it appears after all these years that he made the right choice. While so many young people from Suggs’ generation were trying to “find themselves” Suggs was actually doing something about his future. When he graduated from Western Kentucky University in 1982, Suggs began his coaching career. Twenty-two years later, he has served as a head coach at five programs in Daytona, FL, Willowridge, Port Arthur Lincoln, Beaumont Central and now Nimitz High School in Aldine ISD. Suggs took over the Nimitz program in May of 2004, but even the late start did not keep him from leading the Cougars to the playoffs, the fourth time in the last five years Nimitz has qualified for post-season action. The Cougars finished 6-5 on the year and while he was pleased with the season, Suggs is expecting bigger and better things for the Cougars in the future. 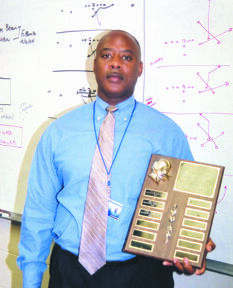 For his efforts, Suggs was named the Northeast News’ Coach of the Year for the 2004 season. The Shelbyville, TN native admitted getting the job at such a late date had something to do with the Cougars getting off to a 1-2 start. The 44-year-old Suggs played linebacker at WKU before entering the coaching profession. He has 20 years of experience in the coaching field and said his high school coach, Jimmy Fiex, had the most influence on him in becoming a football coach. Suggs believes strongly in building relationships with his players and coaches. He believes if there are open lines of communication then trust is built, which is paramount in his profession. When Suggs began his coaching career, he dreamed of coaching at the college level, but over the years he’s realized he’s where he needs to be to have an impact on young people’s lives. When he’s not coaching, Suggs spends his free time with his wife Marva. He is a jazz enthusiast and relaxes by going fishing. And when you are as busy as David Suggs is, that’s invaluable.  Metrorail started its inaugural run on January 1, 2004 with free rides.  North Forest residents began a campaign to oppose the reopening of a concrete batch plant on Mesa.  The Northeast area benefited when Houston hosted the Super Bowl. As a result of the game, the NFL donated $2 million for a Northeast Youth Center. Habitat for Humanity built 38 homes in Wood Glen in the 38 days before the game as part of Superbuild XXXVIII.  North Forest ISD began an investigation into a check fraud scheme that stole more than $250,000 from the district.  Aldine ISD FFA set a record for the Grand Champion steer raised by August Le Blanc. The First Construction group bought the steer for $14,000.  Aldine YOUTH lost half of the annual funding when a grant was not renewed. The center then began plans for the Taking Care of Business Youth School and Renewed Blessings Resale Shop.  An accident with an empty AISD bus and a Dodge Spirit left one of the car’s passenger’s dead and two injured.  An AISD bus en route to a basketball game slid on the wet road on I-45. The bus struck one car and was then struck by another car. Twenty students went to the hospital but there were no serious injuries.  A four-alarm fire damaged a plastic plant on Rankin Road.  An Aldine resident shot three teens when he caught them breaking into a neighbor’s car.  The NFISD FFA set a record with $34,810 in sales at the livestock auction.  A string of robberies at area churches ended when police arrested an adult and a juvenile in connection with the crimes.  The Northeast YMCA ball field was refurbished by Grand Slam for Youth Baseball.  Harvest Time Church hosted the world’s largest block party.  AISD renamed the auxillary stadium after long time Aldine High football coach Bill Smith.  A Carver High team qualified for the world’s largest rocket contest.  Four people were indicted in the NFISD check fraud scheme. One of the four was Valerie Gibson, a seventeen year veteran of the district.  Aldine elected Steve Mead, Art Murillo and incumbents Dr. Viola Garcia and A.W. Jones to the AISD board.  Two women were seriously injured in a two-alarm fire at Country Haus Condominiums.  American Thrift opened its second location at Little York at Hardy.  A car plunged in to the Bayou at the end of Bertrand Street killing the passenger. Residents expressed concern that the accident could have been prevented if the barrier were in place.  NFISD hired Dr. James Simpson as the new superintendent.  HISD’s Herrera Elementary School won the 21st Century School of Distinction Award.  Carver High architecture students won the top prize in their division at the National Technology Student Association Conference.  Area National Night Out parties were successful despite it being one of the hottest nights of the year.  The Harris County Health Department demolished several dangerous structures using the nuisance abatement laws.  An Aldine High students was struck by lightning as he waited in front of the school. Bonifico Aguilar, a sophomore, survived.  Work began at Little York and the Eastex Freeway for shopping plaza that will offer a Home Depot.  Nia Abdullah, a Carver alumni, won the silver medal at the Olympics in the 126 lb Taekwondo finals.  The community dedicated the new Aldine Sheriff’s Storefront.  An evening fire in the Forest Brook High assistant principal’s office canceled classes for a day.  An AISD bus and a pick up truck collided near Carver High. The bus was carrying twenty students; none were injured.  City received a $250,000 grant to stop illegal dumping. Some of the money will be used for video cameras to catch dumpers and for more enforcement officers.  North Forest residents and Traylor Bros. Inc. came to an agreement concerning the reopening of a concrete batch plant on Mesa.  Metro canceled the north leg of route 101 which provided service to Intercontinental Airport.  Construction began on Aldine Mail Rt. sidewalks.  MacArthur graduate, Alberto Gonzalez was nominated for the position of the US Attorney General.  An F-I tornado damaged four classrooms at MacArthur Ninth Grade School.  After 20 years in the making, Mesa Drive was widened from two lanes to four lanes from Halls Bayou to Tidwell.  Macedonia Outreach received a $400,000 TWC grant. All those Houstonians dreaming of a white Christmas got their wish this year when up to two inches of snow fell on the city Christmas Eve. Youngsters did not let this rare opportunity to make a snowman pass. 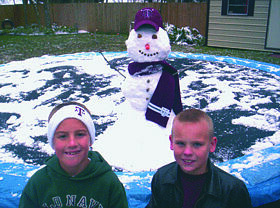 Bryce Kennemer and Taylor Cooling made Frosty the Snow Aggie with the snow on their trampoline. Nyoka Washington and Taneisha Bacon, students at the North Houston High School for Business and members of the National Honor Society, have been nominated to compete in the National Honor Society (NHS) scholarship sponsored by the National Association of Secondary School Principals (NAASP). Lisa Mouton, faculty adviser of the NHS at North Houston High School for Business, announced the nominations at a recent PTA meeting. Two hundred national NHS winners will be chosen this spring to receive $1,000 college scholarships. “These two students are a prime example of the product produced at North Houston High School for Business,” said Jewel M. Hunt, principal at NHHSB. High School National Honor Society chapters from across the country were eligible to nominate two seniors to compete. Washington and Bacon were selected based on their leadership skills, participation in community service, academic achievements, employment experience, and educational goals. They will also be required to write an essay. In recognizing leadership in cocurricular activities as well as academic performance, the NHS scholarship recognizes the importance of a well-rounded education. Cocurricular activities are an important part of the North Houston High School for Business curriculum. While at North Houston High, Washington has been Treasurer of the NHS, student council secretary, a member of the debate team, and involved with the yearbook staf. She plans to attend Texas Southern University next fall to study pharmacy. Bacon has been actively involved in the Honor Society while at North Houston High. Next fall, she plans to attend Spelman College in Atlanta to study biology, ultimately hoping to become a pediatrician. The National Honor Society (NHS) and the National Junior Honor Society (NJHS) are the nation’s permier organizations recognizing outstanding middle level and high school students who demonstrate excellence in the areas of scholarship, leadership, service, and character. As responsible parents, there is no better time than the start of the New Year to reflect on the example we are setting for our children. Although they may not tell us, children look to their mothers and fathers to provide the love and support they need to lead healthy and fulfilling lives. Parents without custody also have the opportunity to influence their children’s growth and development in many positive ways. There is no more compelling evidence of parental concern for a child’s welfare than the regular payment of child support. It is common knowledge that child support payments cover a child’s basic needs, such as food, shelter, healthcare, and clothing. However, the benefits extend beyond the financial security that each payment provides. Research shows that the children of parents who pay their child support have fewer behavior problems, make better grades, and stay in school longer than children who do not receive regular support. Parents who pay child support are also more likely to “be there” emotionally for their children, and take an active role in their upbringing. Children with two involved and caring parents are more confident, more likely to exercise self-control, and less likely to engage in risky behaviors that result in drug usage and early pregnancies. For the state fiscal year that ended August 31, my office collected a record $1.67 billion in child support, topping the previous year’s total by $111 million. This phenomenal achievement was made possible by thousands of Texas parents who faithfully pay court-ordered child support every month without reminders. For parents who need extra encouragement, it is my hope that the beginning of the New year will renew their commitment to provide for their children, and pay their child support. Pleas show your children that you care about their welfare by making regular child support payments throughout 2005. To help parents collect child support, the Attorney General’s Office accepts applications from mothers, fathers and other individuals who request our services. Applications can be obtained by visiting Child Support Interactive on the main Attorney General Web site www.oag.state.tx.us or by calling our 24-hour voice response system at (800) 252-8014. Parents who receive financial assistance through the Health and Human Services Commission automatically receive child support services. Information on this and other topics is available on the Attorney General’s Web site at www.oag.state.tx.us. It starts with a little tickle in the throat, a stuffy nose, a sore neck, an achy feeling in the back, and it just goes downhill from there. I’ve got this box of vitamins on top of the refrigerator, full of vitamin C, cod liver oil capsules, echinacea and multi-vitamins. Every morning my family gets “treated” during the cold and flu season. A major milestone we use to determine whether a person is really sick is when they complain that their hair hurts. One year we caught the granddaddy of all flu bugs. I was so sick that it was too much effort to watch, much less assimilate, what was happening on television. Then my two littlest ones caught it. They lay side by side on the bed for days, unmoving, staring with sightless eyes at the TV screen. The doc said we just had to wait it out. Every half hour or so I’d take their pulse, their temperature and force-feed them liquids. They lived. Thankfully, we’ve never all had such a major illness at the same time. I shudder when I read about those folks in pioneer days when they caught typhoid, diphtheria or some such, and were all down at the same time. Sometimes they owed their very survival to a tiny tot who could still bring them a drink of water. The community knew to stay away from that house until the disease had been eradicated. We don’t handle sickness in such a very logical manner anymore. If you have kids in public school you know that if your kid misses more than three days due to illness, you must have a doctor’s excuse to get them back in. Everybody knows that it takes about a week to get over the common cold, and the doctor will probably tell you to “rest and drink plenty of liquids.” But this holds no water with the schools. Apparently, they don’t believe a mother is capable of diagnosing a cold or flu, so you have to go buy an excused-slip from a medical professional. This mentality also inspires the wholesale prescribing of antibiotics, which in turn creates super bugs resistant to treatment. Meanwhile, we so-called adults drag our damaged bodies out of bed, fill ourselves with some kind of artificially life-giving medication, and weave our way through rush-hour traffic to our jobs, either out of a sense of duty or a sense of fear that some up-and-coming person is going to make the company realize that they really can get by without us. 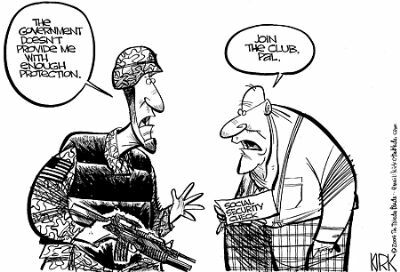 With a system like this, we don’t even need bio-terrorism introduced by an enemy to decimate our populace. We do a pretty good job of it all on our own. Write to Francis Shrum in care of King Features Weekly Service, P.O. Box 536475, Orlando, FL 32853-6475, or send an e-mail to letters.kfws@hearstsc.com. 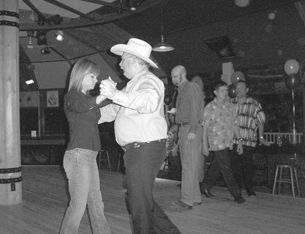 If you would love to go out dancing but have two left feet, then Thursday nights at the Tumbleweed Club is the place for you. That is when long-time dance instructor Gary Hensley gives free lessons to anyone who shuffles into the club on Kuykendahl. From 8pm to 9pm, there are usually fifteen to twenty beginning students paired off to learn country & western dances such as the two-step and polka. After the lesson, students stick around to practice their new moves. “When people learn to dance they are investing in themselves,” Hensley said adding that once you learn the moves, it’s a skill you never lose. Hensley uses an approach that makes learning to dance easy. He makes sure not to push or pull students, but rather helps them to sense the flow of energy. “It’s a rewarding thing to be able to teach a person and teach them right and then be out at a club and see them dancing,” said Hensley. Dancing is a great work out with enjoyable fringe benefits. “It’s good aerobic exercise, plus you get to hold a beautiful woman in your arms while you are doing it which is better than jogging around the block.” He also added that research has indicated that dancing may help to prevent alstheimers. Hensley has enjoyed dancing his whole life. Born and raised in El Campo, Texas, he first learned to dance from his father who was often dancing at political parties. After years of dancing around the house, Hensley started tap dance classes when he was ten. “At then years old, I wasn’t really excited about doing that. But I’ve incorporated some of that into my dancing now,” he said. Hensley’s parents also paid for dance lessons for all their children before the eighth grade dance and prom. In 1994, a foot injury made Hensley hang up his dancing shoes for a while. For three and a half years, he recovered with the help of surgery, a cast, crutches, and physical therapy. But as soon as he was back on his feet, Hensley was on the dance floor. Over the years, he never became bored with dancing because he said there is always a new dance to learn. Anyone can attend the free beginner’s class on Thursdays from 8pm to 9pm at Tumbleweed. A partner is not needed. Hensley also teaches private lessons for a fee. For more information, call Gary Hensley at 713-524-1842. Midway through “Blade: Trinity,” Jessica Biel has a shower scene. Do we get to see anything? Nope. 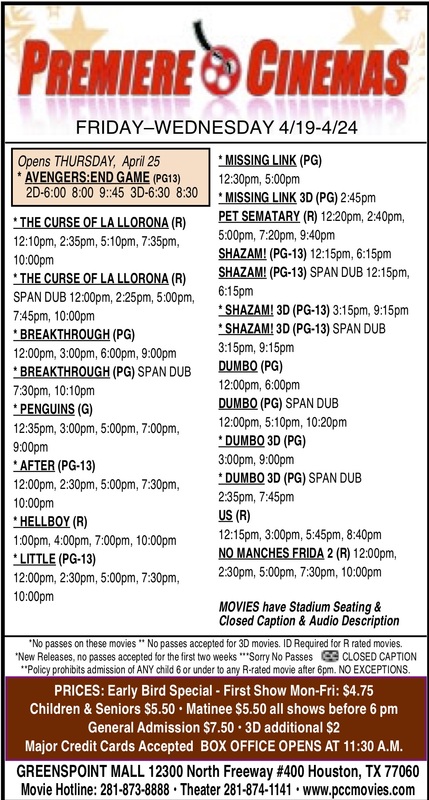 You’d think in an R-rated movie, we’d see … something. Heck, Biel has shown more skin in the pages of Maxim than she does in this scene. And that, in a nutshell, is what “Blade: Trinity” is  a lot of anticipation and no payoff. 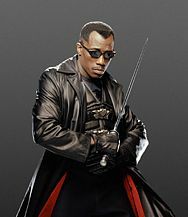 The film stars Wesley Snipes as Blade, an ice-in-the-veins vampire hunter with a samurai sword, leather trench coat and MC Hammer hairdo. A group of vampires (led by Parker Posey) has set up Blade for the murder of a human. So now, in addition to having to fight the entire vampire underground, our hero is also being hunted by the cops. And with that hairdo of his, he isn’t hard to spot, so the cops capture him. Blade is rescued by Biel and Ryan Reynolds, who play the leaders of a team of 20-something vampire hunters. What starts out as a gritty and promising sequel to a dark, violent movie franchise immediately downshifts into a bad episode of “Buffy the Vampire Slayer” once these two show up. Blade stops being the lone, savage stalker of the undead and instead winds up playing the straight man to a bunch of smart-alecky kids. The kids have discovered that Posey’s character has resurrected the original vampire: Dracula. Supposedly, Dracula is the biggest and baldest vamp of them all, but when you see him, he’s just some puffy sack of Euro trash. There are baristas at Starbucks who are more intimidating. Naturally, Blade and the Scooby Gang have to hunt down and kill Dracula. And, not to spoil it for ya, but … the good guys win. “Blade: Trinity” is a letdown on so many levels. The first offense is that writer/director David Goyer betrays the character of Blade and the entire tone of the series by trying to turn it into a comedy. Blade is supposed to be the focus of the movie, not the hapless foil of a bunch of snot-nosed wiseacres. Goyer also rehashes a lot of plot devices from the first two films and, with the exception of the opening fight scenes, the battles in the movie are just plain dull to watch. And worst of all is the blatant and shameless product placement. I know that virtually every film these days has product placement, but in “Blade: Trinity” the film grinds to a halt so that we can have a scene where Jessica Biel loads mp3s from her Apple computer onto her iPod before going out to hunt vampires. If this is the direction these films are going, then I think it’s time to drive a stake into the Blade franchise.